Java annotations were added to Java from Java 5 and now it’s heavily used in Java frameworks like Hibernate, Jersey, Spring. Before annotations, program metadata was available through java comments or by javadoc but annotation offers more than that. It not only contains the metadata but it can made it available to runtime and annotation parsers can use it to determine the process flow. For example, in Jersey webservice we add PATH annotation with URI string to a method and at runtime jersey parses it to determine the method to invoke for given URI pattern. 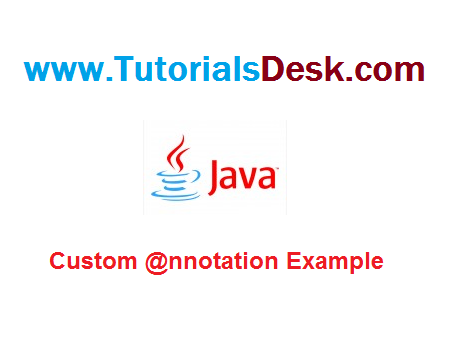 Read here more about annotations in java. Creating custom annotation is similar to writing an interface, except that it interface keyword is prefixed with @ symbol. We can declare methods in annotation. Let’s see annotation example. Annotation methods can’t have parameters. Annotation methods return types are limited to primitives, String, Enums, Annotation or array of these. Annotation methods can have default values. Annotations can have meta annotations attached to them. Meta annotations are used to provide information about the annotation. you can read here in detail about Java Built-in Annotations. Hope we are able to explain you Java Custom Annotation and Parsing using Reflection, if you have any questions or suggestions please write to us using contact us form. (Second Menu from top left).